Surrender, a short film written and produced by Mark, will be part of the Awareness Film Festival which will be held at the LA Live Regal Cinemas in Los Angeles. 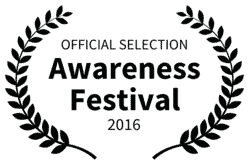 The mission of the Awareness Film Festival is to raise awareness about some of our world’s pressing issues: Ecological, Political, Health/Well Being and the Spirit. They showcase both Documentary and Narrative Features, as well as Short Films, Music Videos and Public Service Announcements. The festival includes filmmaker Q&A’s, filmmaker panels, as well as conscious art and music. Now in it’s seventh year, this year’s festival will run from the 6th to the 16th of October. Surrender is scheduled to be shown on the 16th. The Awareness Film Festival was formed by Heal One World, a non-profit charity and acts as a fundraiser for Heal One World. Any net profits from this event will go completely to charity. For more information on Heal One World and their initiatives, please click here. To find out more about Surrender and view the short film, check out the official website and Facebook page. This entry was posted in film festival, short film and tagged film festival, short film. Bookmark the permalink.